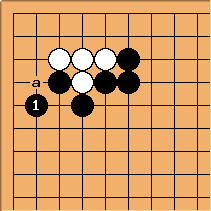 here is a hanging connection, designed to induce White's atari play at a. After that Black will have good shape - just one cutting point; if is at a, potentially an overplay, then Black has two cutting points, which makes it quite hard to kill White (but see 3-4,6-3Enclosure/Query). This is a tenuki variation that is common in practice (NB there is a ladder involved). makes good shape. to live in gote is normal. 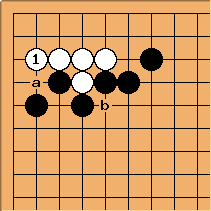 White at a instead lives in sente: but Black becomes thick, since capturing the stone at a is later going to be sente for Black, and the ladder aji of a white cut at b disappears.